Today, Google released a report of its latest progress on the anti-piracy front. Among other things, it stresses that pirate site demotion in search results has helped the company to stay well within the thresholds agreed with the UK Intellectual Property Office (IPO), which are part of the voluntary deal with UK rightsholders. The entertainment industries have repeatedly accused Google of not doing enough to limit piracy while demanding tougher action. For its part, Google regularly publishes updates on the extensive measures it takes to limit piracy on its platforms. The company has today released the latest iteration of its “How Google Fights Piracy” report. It highlights how the company generates billions in revenue for the entertainment industries while at the same time takes measures to counter copyright infringement. The company explains that its anti-piracy efforts are guided by five principles, starting with more and better legal alternatives. “Piracy often arises when consumer demand goes unmet by legitimate supply. The best way to battle piracy is with better, more convenient, legitimate alternatives to piracy, which can do far more than attempts at enforcement can,” Google writes. The other principles include a “follow-the-money” approach, effective and scalable anti-piracy solutions, protection against abuse such as fabricated copyright infringement allegations, and transparency. A large portion of the report describes Google’s policies and results regarding web search. The company stresses that it doesn’t want to link to any pirated content, but that it relies on copyright holders to pinpoint these URLs. “Google does not want to include links to infringing material in our search results, and we make significant efforts to prevent infringing webpages from appearing,” the company writes. Aside from removing more than three billion URLs in recent years, the search engine also helps to promote legal alternatives. This includes “knowledge cards” (which, incidentally, have featured pirate links too), as well as offering copyright holders SEO advice. Earlier this year we reported that the number of takedown notices was starting to decrease for the first time in years, and Google confirms that observation in its report. “The number of URLs listed in takedown requests decreased by 9%, reversing a long-term trend where the number of URLs requested for removal increased year-over-year,” the company writes. Last year, Google was asked to remove 882 million URLs in total, of which 95% were removed. In addition, more than 65,000 sites that were flagged persistently have been demoted in search results, lowering their visibility. This demotion measure is “extremely effective” according to the search giant. “Immediately upon launching improvements to our demotion signal in 2014, one major torrent site acknowledged traffic from search engines had dropped by 50% within the first week,” Google notes, citing a TorrentFreak report. Perhaps more importantly, Google’s demotion measures also passed the tests that were carried out under the Voluntary Code of Practice that Google entered into alongside Microsoft and major UK rightsholder organizations. This agreement was signaled by the rightsholders as a landmark deal and, reportedly, Google is doing well. Thus far, four rounds of tests have been carried out to check whether search engines sufficiently limit the availability of infringing content. These are based on guidelines set by the UK’s Intellectual Property Office (IPO). Google passed them all. “Thanks to the demotion signal and our other efforts to surface legitimate results in response to media-related queries, Google Search has passed the test every time with flying colors — scoring considerably under the thresholds agreed with the IPO,” Google reveals. This suggests that the search engine doesn’t have much to fear from the UK Government, which previously warned that “legislative” measures could follow if search engines didn’t step up their game. While Google says that it’s doing its best, the company is convinced that search is not a major driver to pirate sites and stresses that they don’t control what is on the web. The company reiterates its earlier position that removing entire domains from search results is unacceptable, as that would restrict access to legitimate content as well. Similarly, “filtering” the entire web for pirated content is not an option either. “It is a myth that Google could create a tool to filter the web for allegedly infringing material and remove images, video, and text from our search results proactively. Such a system is both infeasible and unnecessary,” Google writes. Aside from search, Google has also removed content from its other services including YouTube, Google Drive, and Google images. Some of these services were extensively abused by streaming sites last year, but Google says it has taken steps to counter this. Finally, no anti-piracy report these days would be complete without a Kodi mention. The streaming software, which is perfectly legal in its own right, is regularly used in combination with third-party piracy add-ons. Google, which banned the term Kodi from its auto-complete feature, says it removed several set-top boxes with “suspicious” add-ons from Google Shopping. In addition, the Play Store is closely monitored to flag apps with pre-installed pirate Kodi add-ons before they appear online. In closing, Google notes that it remains committed to fighting piracy on all fronts, albeit not at all costs. Anti-piracy outfit Denuvo has published figures that suggest huge 'losses' for games not using its anti-tamper technology. The company says that an unnamed AAA sports title was downloaded more than 355,000 times by BitTorrent users in its first two weeks online, with 12% of those shares happening in the first day. A fortnight of protection, it now suggests, is Denuvo's window of opportunity. All that said, it appears that no variant of Denuvo is invulnerable. Even since the company managed to shut down Bulgarian cracker Voksiearlier this year, new and old players have been taking the company’s protection apart. The emails may look pretty legitimate, especially to people who are unfamiliar with these type of demands, but the Telecom Agency issued awarning today which explains that they are fake. Disney's acquisition of 20th Century Fox has been one of the major entertainment industry stories this year. Indirectly, it also impacts Hollywood's industry group the MPAA, which loses one of its six members. This prompted insiders to rethink the organization's future and reportedly, streaming giants such as Netflix are being considered as future members. Academic publisher Elsevier has repeatedly made the news for its battle with Sci-Hub, the "Pirate Bay" of science. However, while Elsevier is using copyrights to protect its business, academic-insiders accuse the publisher of "anti-competitive" actions. 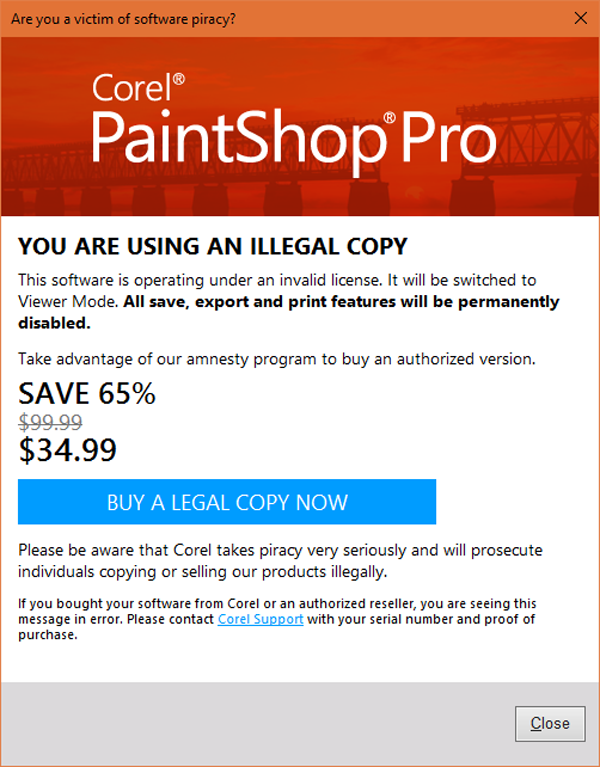 [I]Earlier this year, Corel obtained a patent which enables the company to offer software pirates an amnesty deal via a messaging system. While this can be a smart approach, it is not without its flaws. This week, the company remotely disabled the software of a fully-licensed user of Paintshop Pro and left his medical-related business unable to meet customer needs. “n the very rare event of a mis-identification, I can assure you that we will work quickly to get the issue corrected. We agree that even one customer affected by a mistake like this is one customer too many,” Metrailler said. In a recent submission to the US Trade Representative, the MPAA again states that Switzerland’s copyright law is wholly inadequate, making it extremely attractive to host illegal sites there. The European country has plans to update its laws, but the proposed changes are no significant improvement, Hollywood's trade group notes. While the European Union has worked hard to strengthen its copyright laws in recent years, one country in the heart of the continent chooses its own path. Switzerland is not part of the EU, which means that its policies deviate quite a bit from its neighbors. According to Hollywood, that’s not helping creators. Responding to recent submission to the United States Trade Representative (USTR), the MPAA has identified several foreign “trade barriers” around the world. In Hollywood’s case, many of these are related to piracy. One of the countries that’s highlighted, in rather harsh terms, is Switzerland. According to the MPAA, the country’s copyright law is “wholly inadequate” which, among other things, makes it “extremely attractive” to host illegal sites. “Switzerland’s copyright law is wholly inadequate, lacking crucial mechanisms needed for enforcement in the digital era,’ MPAA writes. One of the concerns is that the Swiss currently have no requirement for Internet services to remove infringing content. In addition, services can’t be held liable for infringements of customers. While this sounds like a rather pressing matter, these recommendations and the associated problems are far from new. The MPAA’s submission does at times read like a broken record, using the exact same language as four years ago, as seen below. These ‘copied’ sections appear throughout the report, also affecting other countries. For example, Hollywood still wants tougher penalties for Australian camcording pirates, using the same text as in 2014. This suggests that, in some cases, no progress has been made at all. In Switzerland, however, that’s not the case. With a new copyright law proposed last year, the Swiss aim to address the critique. For example, the country addresses the hosting problem by introducing a “take-down-and-stay-down” policy. Internet services will be required to remove infringing content from their platforms and prevent that same content from reappearing. Failure to comply will result in prosecution. In addition, the controversial Logistep ruling, which prevents companies from harvesting the IP addresses of file-sharers, will also be addressed. The MPAA is far from impressed though. In a freshly written paragraph, it notes that the new law is still insufficient. The Hollywood group explains that under the proposed law it will remain legal for people to download or stream pirated content privately, while website blocking remains unavailable. “The draft Copyright Act shows significant shortcomings and will not significantly improve copyright protection. The Swiss government has refused to introduce basic elements of internationally accepted anti-piracy legislation into Swiss law,” the MPAA writes. It’s clear that Hollywood is not happy with how things are going in Switzerland, and it hopes that the US Government can help to steer things in the right direction. Unless that happens, we might see the same text appear again in the years to come. Copied from an authorized source, of course. In 2007 and as recently as January 2018, the director of the movie The Man From Earth was championing the promotional effects of piracy. Last week, out of nowhere, he appeared to do a complete turnaround, branding the phenomenon as a threat to all creators. Something didn't feel right about this apparent change of heart. Diving into the details, a bigger picture begins to emerge. In 2007, the movie The Man From Earth leaked on file-sharing networks, with unexpected results. Instead of proving nothing but damaging, the title gained almost universal praise, rocketing the sci-fi flick to stardom via word-of-mouth advertising. Director Richard Schenkman and producer Eric Wilkinson embraced the development and enthused over the attention their work was receiving online. Given the positive experience, during January 2018 the team deliberately ‘leaked’ the sequel – The Man from Earth: Holocene – on The Pirate Bay. Given that filmmakers tend to view piracy as the enemy, TorrentFreak enthusiastically reported both events. Sadly, we had less positive news to convey this week when, out of the blue, Schenkman published an article on the site of pro-industry, anti-piracy alliance CreativeFuture, in which he heavily criticized piracy. There can be little doubt that the piece was a gift to CreativeFuture and everyone who viewed Schenkman and Wilkinson’s place in the piracy debate as something positive for unauthorized sharing. The movie’s story had become a ray of light and here it was being shredded, a disastrous episode from which nothing good had come. At TorrentFreak, however, we had our doubts about the tone of the piece. Never before had we seen such a turnaround, particularly when reviewing all previous correspondence with Schenkman. Something didn’t add up. Mainly due to timezone differences, Schenkman responded to our questions after our article was published. However, his responses only served to increase our suspicions that what had been published on CreativeFuture wasn’t representative of his overall position on piracy. First of all, Schenkman was rightfully furious about his movie being distributed in Russia after being professionally dubbed, with his donation requests removed from the resulting copy. That, most people will agree, is a flat-out insult to someone who has bent over backward to accommodate piracy. He had every right to be annoyed but it’s worth noting that his anger was directed at one site, not necessarily pirates in general. In fact, Schenkman told us that plenty of positives have come out of the releases of both movies. “The only reason that people all over the world knew and loved the original ‘Man from Earth’ was because of piracy, so while I’m disappointed that we’ve (still) made so little money from the first film, I’m deeply grateful that so many people have been able to see my movie,” he told TF this week. “I’m still quite enthusiastic about, and deeply grateful for, the thousands of people who have written to us with kind words about the films, and who have made donations, large or small,” he added. For those wondering whether Schenkman’s piece in CreativeFuture and his comments to us might’ve been penned by a different author, assumption forgiven. From our contacts with him in 2007 right through to the present day, we have found Schenkman to be an honest man and a pleasure to deal with. He has never said anything to suggest that piracy is an “existential threat” to creators as mentioned in his piece. So why the sudden negativity? We all know that life events can shape perceptions, so when the movie’s website and donation portal were hacked around six weeks ago, things began to take a turn for the worse. No revenue for weeks (and thousands in costs to bring it back) appear to have negatively affected the experience for the director. Then other types of piracy happened, ones that ensured that donations would be reduced. 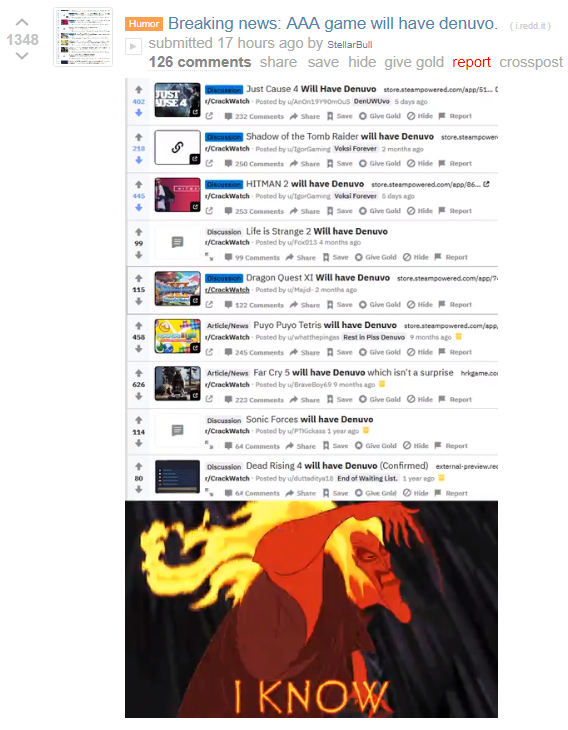 “I learned that there were other people who ignored our requests to share only the version we uploaded, and ripped the movie from BluRay, so that there are versions floating around without my donation preface, even though we DID upload a full HD (BD quality) version of the picture,” Schenkman told TorrentFreak. Even given the above events, however, the piece in CreativeFuture appears unnecessarily one-sided for a man who still had confidence in the piracy ecosystem a few months ago. Indeed, Schenkman told us this week that his team planned hard for the ‘pirate’ release of Holocene. “In the case of the new film, we worked for months to promote awareness, so that there would be a groundswell of interest from fans of the original film. I would say that this effort at least partially worked,” he explained. “In the first week of the pirate release, many thousands of people a day downloaded it, so there was a clear pent-up demand. And we’ve seen more donations come from the ‘Holocene’ release than we ever did from [Man From Earth] alone. So yes, in that sense, the ‘authorized leak’ of the new film has definitely helped spread awareness. “The movie would have been pirated regardless; by doing it ourselves, we were, to some degree, able to control the narrative, and indeed it became more of a ‘story’, just the same way that ‘producers thank pirates’ became a story at the time of the original film’s release,” he added. In a long email exchange, Schenkman told us that plenty of fans who didn’t even particularly like his sequel contacted him to congratulate him on choosing the honor system, while donating $5 as a ‘thank you’. “You’d be surprised at how many of those messages I’ve gotten,” he told us. But while Schenkman might be surprised at this generosity, we certainly aren’t surprised that none of this came out in the CreativeFuture piece. It’s understandable that CreativeFuture want to fight their corner with a flawless, polished, and invulnerable anti-piracy narrative, but thankfully we aren’t afraid of calling out both sides of this war, when it’s called for. People deserve that honesty. For example, Schenkman wanted to speak about some of his frustrations with movie distribution in his article. He believes that the international distribution system is flawed because there isn’t an efficient and fair commercial way to make an indie movie available everywhere, on the same day, unless Netflix buys it. Those sentiments didn’t make the CreativeFuture piece but we’re happy to let him have a voice here. “Even now, there isn’t a fair, equitable way for an indie filmmaker like me to make their movie available everywhere around the world at once. Even Amazon, which is in virtually every country, doesn’t allow you to simply upload your movie and with the click of a button make it available everywhere,” he says. “I think they’ll eventually get there, but not anytime soon. If Netflix buys your movie, great — but if they don’t, you’re back to the antiquated system of going to international film markets and trying to sell you film country by country, a costly, inefficient, and time-consuming process (and again, you’re totally at the mercy of the ‘gatekeepers’). “When we first released ‘Holocene’ we also made it available at Vimeo and MovieSaints, two platforms which allow access to viewers from most countries. Moviesaints has a unique system allowing both for a partial refund if you don’t like the movie, as well as a ‘tip the filmmaker’ function if you want to provide more support,” he adds. And then comes an even stronger hint as to why Schenkman’s important comments didn’t make his own article. “While we’ve seen revenue from both of these platforms, it doesn’t approach the total we’ve earned from donations. So the good news is that thousands of people who watched ‘Holocene’ via the pirate ecosystem have kindly, generously made donations to help support independent film,” he says. Of course, in the interests of fair reporting we’re absolutely unafraid of publishing the not-so-good news too, so here it is – warts and all. “The bad news is that hundreds of thousands (or millions) more have not, and thus we are still a long way from breaking even on this very low-budget movie. I really don’t see a sustainable business model for a truly independent filmmaker creating these kinds of thoughtful, serious movies, although I remain open to ideas!” Schenkman concludes. While CreativeFuture are absolutely entitled to publish whatever they see fit on their own site, it seems clear from Schenkman’s article (and his comments to us spanning more than a decade) that they are only interested in a tightly-controlled narrative that leaves room for criticism of piracy, but none to detail some of the self-inflicted reasons behind much of it. Piracy is certainly controversial and it can be bad, we’ve acknowledged as much in this piece. But hiding important parts of the full story – especially when they highlight flaws in the distribution system that contributes to piracy’s existence – is just as corrosive. Hitman 2 is due to hit the streets on November 13, protected by the most up-to-date variant of Denuvo's anti-tamper technology. However, a cracking group appears to have obtained a version of the game destined for pre-order buyers, cracked it, and released it online three days early. Just last week, Denuvo suggested that four days protection could prove significant for game sales. Protecting video games from piracy has become big business over the years. The latest games consoles from Sony and Microsoft appear relatively secure but the same cannot be said about PC titles. Due to the fact that PC games are loaded onto a platform that is instantly accessible to hackers, it’s almost inevitable that any games worth having will have their piracy protections removed at some point and leak online for all to download. The company on the anti-piracy frontlines is Denuvo. Its anti-tamper technology is fiendishly difficult to crack and as such it regularly finds its way on to many of the gaming world’s most cherished titles. However, Denuvo is not infallible so regularly finds itself targeted by crackers. This weekend, the technology suffered yet another disappointing blow. The long-awaiting stealth game Hitman 2 – which comes ‘protected’ by the latest variant of Denuvo (v5.3) – leaked online. Aside from having its protection circumvented, this happened three days before the title’s official launch on November 13. It appears that a relatively new cracking group called FCKDRM (more on them in a moment) obtained a version of Hitman 2 that was only available to those who pre-ordered the game. There are some reports of the crack failing at times on some machines but nevertheless, this leak is important on a number of fronts. Firstly, the game leaked online three days early, rendering the protection when the game finally comes out much less useful. Secondly, presuming the original copy of the game was obtained on Friday when the pre-order copy was delivered, it took just a single day for the group to crack Denuvo’s latest protection. Considering an announcement made by Denuvo just last week, this is a pretty embarrassing turn of events. Denuvo’s aim is to protect games in their initial release window and according to the company, having no protection can result in millions of dollars in potential lost revenue in just a couple of weeks. To be on the safe side, however, the company also highlighted the importance of protecting games for just four days (notably a couple of Denuvo-protected titles recently withstood attack for the same number period). Winding back further still, the company said that even providing protection for an hour is worthwhile. Clearly, minus three days didn’t figure into Denuvo’s plans. There’s no suggestion at all that GOG is involved in the cracking of Denuvo, of course, but the FCKDRM group are using GOG’s FCKDRM logowhen announcing releases, which certainly has the potential to confuse casual pirates. Given that Denuvo 5.3 was cracked so quickly (some crashing issues aside) it raises questions about other upcoming titles set to use similar technology. They include Battlefield V from EA/DICE, which has its official full release on November 20 but is already available to early access players. The top 10 most downloaded movies on BitTorrent are in again. 'Mission: Impossible - Fallout' tops the chart this week, followed by ‘The Equalizer 2'. 'The Meg' completes the top three. YouTube's CEO is warning that the platform may have to begin blocking videos in response to legislation making its way through the EU Parliament. The final text of Article 13 is yet to be decided but Susan Wojcicki is warning that the current wording would hold it responsible for the copyright infringements of users, something that could impact the livelihoods of hundreds of thousands of people. Some of the proposals were hugely controversial. Article 13, for example, would see the liability for infringing content switched from users of sites like YouTube to the platform itself. But, despite warnings, in September the European Parliament voted in favor of proposals put forward by Axel Voss’ EPP group. This is a revised version of the original proposal, but one that would still pave the way for upload filters, to prevent infringing content from reaching sites like YouTube in the first place. However, speaking today in Financial Times (paywall), YouTube CEO Susan Wojcicki says that blocking videos may be the platform’s only option. “While we support the goals of article 13, the European Parliament’s current proposal will create unintended consequences that will have a profound impact on the livelihoods of hundreds of thousands of people,” Wojcicki writes. Using the hit “Despacito” as an example, Wojcicki says that the track contains multiple copyrights including sound recording and publishing rights. YouTube has agreements with several parties to license the video but other rightsholders remain unknown. This could present a situation so complex that YouTube might have to stop hosting the video altogether. “That uncertainty means we might have to block videos like this to avoid liability under article 13. Multiply that risk with the scale of YouTube, where more than 400 hours of video are uploaded every minute, and the potential liabilities could be so large that no company could take on such a financial risk,” she adds. While the rest of the world appears to be safe from such blocking, YouTube’s CEO warns that it is EU residents that will be affected. During the last month alone, videos were viewed by citizens more than 90 billion times. Wojcicki says her company wants to work with policymakers and the industry to develop Article 13 in a way that protects rightsholders but without stifling the creative economy. That might including broader licensing agreements, improved collaboration with rightsholders, and technical solutions, similar to Content ID. “Platforms that follow these rules, and make a good effort to help rights holders identify their content, shouldn’t be held directly liable for every single piece of content that a user uploads,” Wojcicki writes. In a report last week detailing how Google fights piracy, the company noted that between October 2017 to September 2018, YouTube had paid more than $1.8 billion to the music industry from in advertising revenue alone. Last Friday, however, that figure was challenged by IFPI Chief Executive, Frances Moore. “We welcome Google’s recognition that it and Google’s YouTube need to operate responsibly and properly value creators and their work. However, the figures in Google’s anti-piracy paper don’t match our own,” Moore said. It seems clear that YouTube and the music industry are yet to see eye to eye on this problem but with the platform suggesting that blocking might be the only option, as we envisioned earlier, the pressure is increasing on supporters of Article 13 to avoid this worst-case scenario. The owners of now-defunct ROM sites LoveROMS.com and LoveRETRO.co have agreed to a $12 million judgment in favor of Nintendo. The operators, a married couple, admit to both direct and indirect copyright and trademark infringement. Both parties requested the court to sign off on this unusual judgment, which will end their legal battle. It quickly became clear that the Mathias and his wife, who was later added to the complaint, were not looking forward to a drawn-out legal battle. Instead, they engaged in settlement discussions with Nintendo, hoping to resolve the matter without too much bloodshed. Today we can report that both sides have indeed reached a deal. They agreed to a consent judgment and a permanent injunction that will resolve all outstanding disputes. Paperwork obtained by TorrentFreak shows that Mathias and his wife admit that their involvement with the websites constituted direct and indirect copyright and trademark infringement, which caused Nintendo irreparable injury. However, on paper, the married couple won’t be getting off cheaply. On the contrary, they actually agreed to a judgment that exceeds $12 million. “Plaintiff is hereby awarded judgment against all Defendants, jointly and severally, in the amount of $12,230,000,” the proposed language reads. It seems unlikely that the couple has this kind of money in the bank, or that a jury would have reached a similar figure. So why the high amount? We can only speculate but it’s possible that Nintendo negotiated such a high number, on paper, to act as a deterrent for other site operators. In practice, the defendants could end up paying much less. It wouldn’t be the first time that a judgment in court is more than what the parties agreed to privately. This happened before in the MPAA’s lawsuit against Hotfile, where a $80 million judgment in court translated to $4 million behind the scenes settlement. In addition to the monetary judgment, both parties also agreed on a permanent injunction. This will prevent the couple from infringing Nintendo’s copyrights going forward. They further have to hand over all Nintendo games and emulators they have, at their own expense. On top of that, the permanent injunction requires them to sign over LoveROMs.com and LoveRETRO.co to the Japanese company. The documents have yet to be signed off by a judge but considering that both parties agree with it, that should be a formality. After that, it’s game over. SETTV, an under-fire IPTV service previously sued by several Hollywood studios, has suffered a crushing blow in another US-based lawsuit. After being sued by DISH Network and Nagrastar for retransmitting the former's content without authorization, SETTV has now agreed to pay the plaintiffs more than $90 million while shutting down and handing over its domains and equipment. Back in April, the Alliance for Creativity and Entertainment, the global anti-piracy alliance featuring several Hollywood studios, Amazon, Netflix, and dozens of other entertainment companies, sued Florida-based SET Broadcast, LLC. The popular unauthorized IPTV was accused of being a piracy tool offering copyright-infringing streams to a large number of subscribers. Early June, SETTV went offline after a second lawsuit was filed against the company. In a Florida court, DISH Network and encryption partner NagraStar sued several individuals, companies and trusts collectively doing business as SETTV via the domain SETTVNOW.com. The plaintiffs stated that the complex business structure was designed to frustrate enforcement efforts and hide profits made by SET Broadcast and various individuals. DISH and NagraStar alleged that “for only $20 per month”, SET TV gave users access to more than 500 live channels, including on-demand content and PPV broadcasts. The company also sold pre-configured hardware devices that came pre-loaded with the SET TV application. As a result, the plaintiffs demanded a permanent injunction plus huge damages. In an agreed judgment handed down by a Florida court (the merits of the case were not considered), the demands of DISH and NagraStar have now been met. “DISH is awarded statutory damages of $90,199,000 under the FCA. The statutory damages are calculated at the parties’ agreed upon $500 for each of the 180,398 subscribers that were acquired directly by Defendants and provided with unauthorized access to DISH’s television programming using Defendants’ SetTV streaming service. Defendants are jointly and severally liable for all damages awarded herein,” the judgment reads. The defendants in the case (and anyone acting in concert with them) are also permanently enjoined from “receiving, retransmitting, or copying, or assisting others in receiving, retransmitting, or copying, any of DISH’s satellite or over-the-top Internet transmissions of television programming or any content contained therein without authorization”, and having any dealings with infringing subscriptions, set-top devices, or applications. DISH also won the right to take ownership of all SETTV-branded set-top boxes, similar devices sold through resellers and affiliates, plus subscription codes, passwords and applications relating to the SETTV service. Additionally, SETTV is required to hand over any domains relating to its service, including but not limited to SETTVNOW.com and SETBROADCAST.com. “The judgment and injunction against the SetTV service marks a significant victory in the ongoing fight against pay-TV piracy, and a win for consumers who subscribe to legitimate pay-TV services,” DISH said in a statement. “Following extensive discovery, DISH and the SetTV Defendants reached a confidential settlement agreement. Pursuant to that agreement, the Parties filed stipulated facts and admissions of liability by the SetTV Defendants, along with an agreed judgment and permanent injunction that was entered by the Court on October 24, 2018. In common with similarly large damages rulings, it’s unlikely that SETTV will pay anything like the amount cited by the Court. However, the $90m judgment makes great headlines and is likely to act as a deterrent to all but the most aggressive US-based pirates. There are plenty of options for copyright holders to frustrate the operations of pirate sites, but one of the most effective is to attack their domain names. In recent years, various entertainment industry groups have called on the domain name industry to help out on this front. As a result, the MPAA signed a landmark agreement with the Donuts registry under which the movie industry group acts as a “trusted notifier” of “pirate” domains. A similar deal was later announced with the Radix registry. This was later followed by a much more ambitious plan. Last year, the Domain Name Association, which counts prominent registrars and registries among its members, unveiled its Healthy Domains Initiative, a voluntary self-regulation scheme to tackle all kinds of abuse. According to the initially published outline, it would institute a copyright arbitration policy to deal with pervasive instances of copyright infringement. This would allow copyright holders to request that domain names be taken offline, without going to court. This plan, also referred to as SCDRP, was listed as a proposal from the Public Internet Registry (PIR). PIR oversees the registrations of .org domains, including ThePirateBay.org, which was a likely candidate for this arbitration process. According to Idaho Law Professor Annemarie Bridy, who recently published a handbook chapter on developments in copyright-related domain and DNS regulation, the arbitration plan would dwarf that of the MPAA’s trusted notifier agreements. “If PIR were to implement the SCDRP, the RIAA would almost certainly succeed in having the Pirate Bay quietly shut down without subjecting itself to the expense and publicity associated with a lawsuit against its longtime nemesis,” Bridy writes. However, more than a year has passed and the proposed arbitration scheme appears to have vanished. The Domain Name Association’s Healthy Domains Initiative is still alive and taking proactive steps against abuse, but the copyright arbitration proposal has been removed from the earlier document. So what’s going on here? As it turns out, many prominent players in the domain name industry felt that the copyright arbitration plans went a step too far. Registries and registrars believe it’s their role to help the public set up domain names and manage DNS entries, but they don’t want to take an active role as copyright enforcers of content they don’t ‘host’. “It was really strongly pointed out to the working group that the hosting services are not necessarily in the same division or even same company, and that such things are entirely outside of the registration process,” Jothan Frakes, Domain Name Association’s Executive Director, informs TorrentFreak. “The registry or registrar thus are really not part of that content hosting process, and injecting them into that process or putting registrar or registry in the role (and costs and potential legal exposure) of content policing,” he adds. That said, under the Healthy Domain Initiative, these companies do take action against domain names with other problematic content. This includes domains pointing to “rogue” pharmacies and child abuse. Many registrars and registries clearly felt that the copyright arbitration plan went too far though. The Public Internet Registry (PIR) shares this observation. The organization’s general counsel previously said that they are not happy with The Pirate Bay’s presence on an .org domain, and that it’s a prime candidate to be removed under the right conditions. However, PIR is not happy with initiatives such as the MPAA’s trusted notifier scheme and after discussions with other stakeholders, it felt that the copyright arbitration plan lacks support as well. This means that PIR will not implement SCADR, despite repeated calls from rightsholders and governments to engage registrars and registries in potential content regulation. “Public Interest Registry is an advocate for a free, open, safe and secure internet. To that end, we believe that any effort to mitigate content-related abuses should be tightly circumscribed and keenly focused on fostering these principles and ensuring due process,” PIR informs TorrentFreak. And so ThePirateBay.org and many other domains are safe, for now. The decision to remove the arbitration plans obviously comes as a huge disappointment to copyright industry groups such as the MPAA and RIAA. While they can still take action against domain names, they will have to go to court instead. For more than a decade, alleged file-sharers around the world have been pressured to pay significant settlement fees. These so-called copyright-trolling efforts are fairly straightforward. Copyright holders obtain a list of ‘pirating’ IP-addresses and then request a subpoena from the court, compelling ISPs to hand over the associated customer data. In recent years, several news reports have appeared on these cases in the US, Canada, Sweden, Denmark and elsewhere. In Finland, they have been a common sight since 2013. Adultia is one of the companies that’s active in the Nordic country which, as its name suggests, deals with adult content. Helped by the Cyprus-based company M.I.C.M, it obtained personal details of thousands of Finnish subscribers, asking them to pay up, or face legal action. At the start of this year, the company appeared to have halted its practices. No new letters were being reported, which was carefully celebrated as a win by copyright troll opponents, many of whom are active in the local MuroBBS community. However, the excitement didn’t last as the letters returned after a few months, albeit in a different form. At the end of September, several people who were previously targeted by Adultia started to receive new letters. While the accusations and details were the same as before, they were sent by KTC Finland Oy this time, which is a local debt collection agency. The letters were reported in the MuroBBS forum where they raised eyebrows. According to several activists, these “debt collection bills” were not lawful, as the earlier letters from Adultia were not official debts, but accusations. In response, several opponents helped to draft template response letters, accusing the debt collecting company of breaking the rules. These were sent to the debt collection outfit, as well as government officials. After a few weeks, this had the desired effect. Late last month, Timo Korhonen, chief investigator of Finland’s Regional State Administrative Agencies (AVI) in Finland, wrote a post on MuroBBS stating that KTC’s actions were now under investigation. AVI’s involvement has weight as it ensures that companies, including debt collectors, follow local rules and regulations. In case of severe violations, it also has the power to revoke licenses of debt collectors. The pressure was building, as AVI’s involvement was also picked up by the local news site Tivi and Ilta-Sanomat. Last week, KTC announced that it will withdraw from the copyright debt collection business. “Because of the widespread attention, we have decided to stop collecting these debts. Because of our high standards, we are now concentrating on serving our other customers and thus we leave control over these copyright matters to companies that are specialized in it,” KTC writes on its website. KTC maintains that its practices are in accordance with the law and encourages people who received a legitimate demand to pay. However, no new letters will go out. While the anti-trolling activists at MuroBBS see this decision as a clear win, they hope that AVI’s investigation will pay off, noting that copyright trolling remains a problem. Law firm Hedman Partners is reportedly still active, for example, using the court to go after alleged pirates. TorrentFreak spoke to activist ‘Don MC’ who notes that details behind 200,000 IP-addresses have already been handed out. While there are signs the court is more reserved now when it comes to these cases, copyright trolling remains a problem. “Lately, and perhaps even by the influence of the civil activists on the MuroBBS board, the Market Court has tightened its criteria and no longer hands out these addresses en masse,” Don MC explains. This morning, the Asia Video Industry Association’s (AVIA) Coalition Against Piracy (CAP), which represents the interests of groups includingthe MPA and other major companies, revealed the results of a commissioned YouGov survey.